Infinity 2 thoughput slowed down - BT_Care contact please? After 3 weeks of a steady 55megs down and 13 megs up, this morning I was down to a stonking 0.5 megs down and 0.8 megs up! I use homeplugs and have removed my wireless cards from the boxes. All that happened was I needed to restart the hh3 (changing some mains plugs) and I got a new IP. The last 3 weeks I was on a 31.x.x.x and now I am on 86.x.x.x (since November I have only ever has 86.x.x.x. or 109.x.x.x). So, where did the 3.x.x.x come from - and why did this one stay connected at the correct speed, whereas the 86 and 109 IP's always shudder to a stop after a day or so! This problem has been around since the New Year - but I also had 2 instances in the beginning - but generally fine for the first 3 months at 40/10 - I got a good 37.5 all the time. Yes, I know dozens of people are seeing the same on the BT_Care forums, but no-one wants to own it as a problem - curing with a hub reconnect is the usual solution, but this is just not acceptable in the long term. This is a technical problem which need technical people to sort out. I am happy to work with the techs if need be. Do I order a new HH3? How are you measuring the throughput? Ok, I am guessing at throughput being the issue ... if I download any file from Tbb, it just takes for ever ... yesterday I was seeing 2-4 megabyte per sec download speeds, whereas a test today before restarting was around 0.01 to 0.2 megabytes per sec. On reconnect (ie just reconnect, NOT arestart! ), back to normal. Others have reported from their logs that the modem sync speeds do not change, but the download and upload speeds just drop away to sub 1 mbps. bbmax shows 52 down and 9 up. Is there anyway to persuade the server to give out the 31 IP address range again? 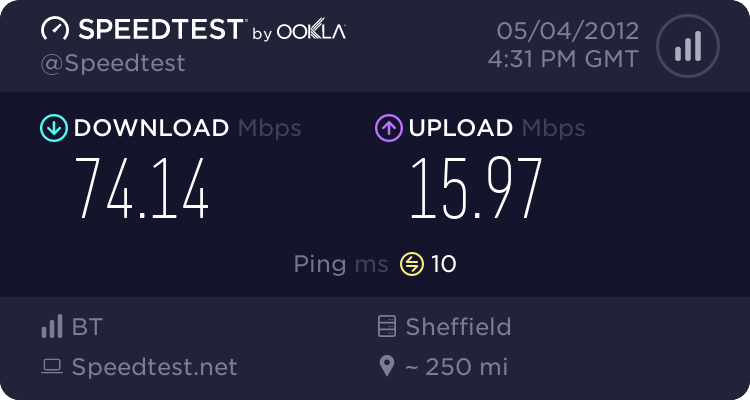 You can have mine - I'm currently on a 31. address and my download speeds are rubbish (unless I set multiple threads going at the same time). I don't think it's anything to do with IP ranges. From 14th December, last year, through to Monday this week I was on an 86. address. Throughput was fine until 2-3 weeks ago (roughly the same time as BT started rolling out the 80/20 product). I tried the holy grail of a modem & router reboot (apparently this "fixes" the problem) and ended up on a 31. range address. Speeds are no different from when I was on an 86 address. I did spend a few days on an 86.163 address (God knows where BT got that dodgy range of addresses, but Magic FM wouldn't stream because it thought I was outside of the UK). If it's not the IP address range - and it seems to start when the 80/.20 stuff is rolled out. Is it that the HH3 can't cope with the increased data rates from the FTTC products (it happens with 40/10 as well). But, why is it only some HH3's - mind you looking at the BT forum, there are loads of them. I also saw my IP profile go from 66.1 up to 66.2 at one point. Now, it has dropped to 55.7 all of a sudden, and I get these slow downs again. UInless you know different and this CAN be done by someone ... I bet it can, just needs the OR engineer to phone through to someone. I'm not even sure the slow speeds (speeds significantly below profile) are anything to do with IP profile. Since switching to Infinity (last August/September - can't remember which) I've had only two IP profiles - the maximum for a 40Mbps sync (when I was on the 40/10 product) and the maximum for an 80Mbps sync (since I've been on the 80/20 product). This hasn't stopped me getting speeds of anywhere between 4Mbps and 76Mbps. For me; rebooting the HH3 (or the cheap Chinese modem) has no effect. Downloading multiple threads at the same time always maxes out my connection. Downloading a single thread can give speeds anywhere between 4 & 76Mbps. To me; it always looks less like router/modem/server issues and more like BT throttling single threads. If I'm right no amount of switching IP range, rebooting routers or swapping Home-Hubs for Netgears will fix the problem. Switching to Sky Fibre might. When on the 40/10 in November until I switched, I was on IPP 40/10, and got 37.5 and 8.6 up. Now on the 80/20, I am now on IPP 55/20, but was onmuch more a little while back. Like you I can get (have had) speeds from 0.5 megs up tp 64 megs (although now my max is 50!). I DO find reconnecting the router fixes a low d/l speed. The upload never seems to be affected - and this also seems to go with throttling eh? SO, after a link has been up for "x days" do they then throttle it down until you get a new IP issued? And it starts all over again? Problem here is that there are people who DO NOT see this problem at all and have stable high speed always lines! Many use a different router. I think I may give India a call and get an engineer out and see if we can get the IPP reset somehow ... don't mind a new "training period" - if it goes the same way, then I know I can rule out a number of things. PS Still, it's better than the 135k-160k I got before with BT and 3-4 megs with O2. When you say "reconnecting the router" do you mean the Home Hub or the Huawei modem? If you're just rebooting the Home Hub (and that fixes the problem) I can't see your problem is related to the line itself, BT throttling, IP address or anything else (other than a dodgy Home Hub, or it slowing your connection if too many sessions - e.g. bit-torrent - are open). In any case I can't envisage an ISP throttling system that purposely throttles your speed back, starting several days after allocation of an IP address, then releasing the throttle when you reconnect and are given a new IP. That kind of throttling action (especially for Infinity products) would eventually result in almost every single Infinity customer being throttled (because most of us never see reconnects unless we instigate them - simply because VDSL2, over very short lines, is so stable - for example; before the 80/20 upgrade I once kept s solid connection, and IP address for 11 weeks and saw no sign of throttling). These speed drops are something new (only noticed in the last few weeks). It can't be just a coincidence that they started at pretty much the same time as BT rolled out their 80/20 product. It's clear, to me, we are experiencing throttling (presumably because BT didn't forward plan and get enough additional backbone, or exchange back-haul, leading up to the 80/20 roll-out). I'm sure there are a number of BT fans out there who will go to great lengths to insist this isn't happening (quotes like "it isn't happening to me, so therefore there's no problem" are sure to appear). As the slow speeds aren't affecting all of us, but there are enough of us affected (most of us connecting at full 80/20) to suggest something is going on. It could be on an exchange by exchange basis (indicating certain exchanges are running out of back-haul). It could even be down to individual cabinets. But sure as eggs is eggs, whenever peak time starts speeds drop. My speeds plummeted after around 5pm today. 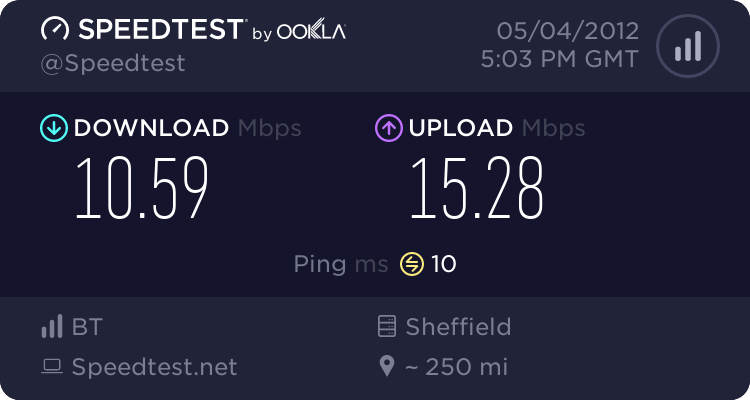 At 4:31pm I was getting 74Mbps from the Manchester Xilo server for Speedtest.net - at 5:03pm (only 32 minutes later) I got this. Ever since 5pm my speeds (to the same test server) have been all over the place (7 minutes after the 5:03pm test I got 56Mbps, then 9 minutes later I got 36Mbps). I'm now (at 9pm) getting 16Mbps download. At all times I can max out my line with multi-thread downloads (indicating line speed/profile is not being affected and the low speed is a throttle per download thread). You'll note the ping is constant (at 10ms) - I've rarely seen anything else to the Manchester server, so it's clear we're not suffering from congestion (which normally affects pings quite badly). It's throttling; pure & simple (to stop the network from becoming congested). Now the BT fan-boys slated Entanet (some time back) when they operated a similar system (variable throttling to protect pings and prevent network overload - what I'm seeing now is an almost exact copy of the effects of Entanet's variable throttling/management system). In actual fact; I quite like the idea of this type of throttling if (and ONLY IF) it's a temporary measure, to protect pings (high pings badly affect gaming, streaming, etc.) whilst an ISP waits to upgrade their network. My worry is BT will continue with this system! I will deliberately keep my current IP and I won't reboot the HH3 or the modem and I'll put money on my speedtest results going right back up after peak time ends. As for rebooting; it's quite possible a modem reboot (resulting in a change of IP) may fool BT's throttling system (for a while), but I wouldn't recommend repeated modem reboots (or resyncs) especially for those of you connecting below maximum sync - you all remember how flaky BT's DLM is with ADSL. What's to say repeated resyncs on FTTC isn't going to result in BT's DLM punishing you for having an unstable line? Just going into the hub and disconnecting from internet and then connecting. This gets a new IP, but does not affect the modem sync etc, and I would suggest does not impinge on the DLM either. I leave the modem on all the time, and have only rebooted it a couple of times since November. This via homeplugs, so I guess things may be a little better with a direct ethernet link.